What's the difference between an Englishman, an Irishman, and a Scotsman? No. Don't worry your pretty little head off, my friend. This is not a joke. I don't do colloquial jokes. I leave stuff like that up to everybody's favorite potato eating Frankenstein -- Dara Ó Briain -- as seen in this 90 minute stand-up show made in 2006. Begorrah! Now can you guess what the following six subjects have in common? (1) The Milkybar kid. (2) Education. (3) Parenting. (4) Relationships. (5) Ireland. And (6) Steve, the bullet-proof ex-army vet called, who's currently working in the 'Ambulance Service'. Nope. You're incorrect, dear reader. These topics don't have anything to do with Dan, the non-descript designer from Vauxhall. Plus James, the German-speaking pianist / sociologist, doesn't even enter the equation either. 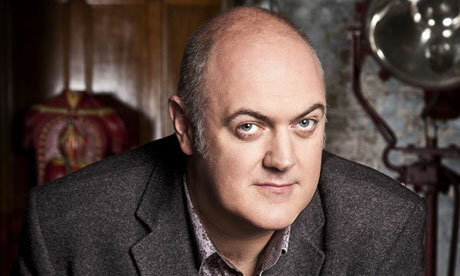 Dara Ó Briain is the comedic-glue that holds these six topics all together. Binding them as one, and massaging them within his live stand-up gig held somewhere in old London town. Here, what now follows are a couple of quotes taken from this comedy fest. I don't believe in God, but I'm still Catholic. I once asked a member of the audience 'What is the grandest thing he ever done?'. And he said back to me 'I was the Milkybar Kid', as if that were the right thing to say. All that stuff you learn in academia is vital when you're living in the real world. Ha! I don't get parents who fill their kids up with lard, and then wonder why they can't get them up in the morning. In England you're not allowed to drive whilst holding a hand-held microphone. That's a very specific law. In Ireland there are three types of law: 'Ah! That's grand' -- 'Don't push it' -- and 'Stop taking the piss'. There wasn't any identity theft until people stopped signing things! When the bombs when off in London, all the people reacted in a very English way -- 'If they're bombs on the Piccadilly line, I can always use the Bakerloo Line instead'. American Banking -- Banking with a twang. Oh! I know. It's the Jewish year of the rat! If we were made by God, why do we occasionally bite the inside of our mouths? My Ipod is very frustrated. It's like a housewife who gave up her career, only to discover that her children turned out sh*t afterwards. I said to the bed-man 'That bed I tried was too soft'. And he said back to me 'Some people are afraid of comfort'. Do you have any Irish in you? Would you like some? Ops! Bad joke. There is only one thing that's changed in Ireland since I left it -- more baguettes. Oh no! Not the International Gay Mafia! She didn't ask my permission when she became a whore! Did she? Now in closing his show, Dara graciously thanks all of audience members he took the piss out of, before getting one member in particular, to shout 'The Milkybar's are on me'. Honest to shamrock! I noticed one thing nigh on straight away whilst watching 'Dara Ó Briain Live at the Theatre Royal'. No. Not that Dara's bald. I knew that already. I could tell by the way his side-parting vanished into his brow. Rather, its how much Mister Ó Briain interacted with his studio audience! Literary, diving right in from the very start of his show, trying his best to 'warm them up' by chatting to them and 'having a laugh' -- so to speak. Granted, I know from my own personal experience with 'audience participation', that sometimes it can be a right drag if you're one of the many. Yet, for the life of me, I don't think I would have thought the same thing if I attended this gig with the rest of the gang. I could just imagine what this lumbering comic would've come up with about me and my occupation. "Oh! So you're a blogger, huh?" he might say. "Is that something to do with floating turds?" he'd continue. Before changing the subject to the 'sanitary contentions' in Ireland -- or... err... something like that. But I wonder why he does this though? Admittedly, to a certain degree I can understand that Dara has to get his audience 'in the mood' for comedy. Moreover, this type of thing does breed a communal synergy amongst the crowd, allowing him -- and them -- to feed off of each other, imbuing the overall occasion with a unique and wholesome flavor. All in all 'Dara Ó Briain Live at the Theatre Royal' is just one grand stand-up shindig to watch. It's funny. It's warm. It's insightful. And it has a very nice way of highlighting the best of Irish humor, plus how audience participation isn't as bad as people might presume. Right, Dara?